To celebrate the release of My Foolish Heart, I'm hosting the Miss Foolish Heart Party! Join me June 16th at 5:00 PM PST (6 MST, 7 CST, 8 EST)! Don't miss the fun and BRING YOUR FRIENDS and be sure to pick up a copy of the book (Not necessary to join the fun! Who knows - you might win a copy!) and join us at 5:00 pm on June 2nd at my Author page. 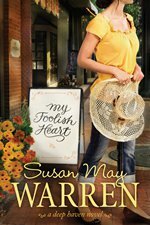 Have a question for Miss Foolish Heart? Or about the book? Leave it here and we'll chat it up at the party! Don’t miss the fun! I'm so looking forward to connecting and learning more about you – so be sure to stop by on June 16th at 5:00 PM PST (6 PM MST, 7 PM CST, & 8 PM EST). Oh, and bring your gal pals and let them join in the fun. I’d love to introduce myself and make some new friends. 5:05 Story behind My Foolish Heart. 6:00 Sneak peek of my next book – due out in August!